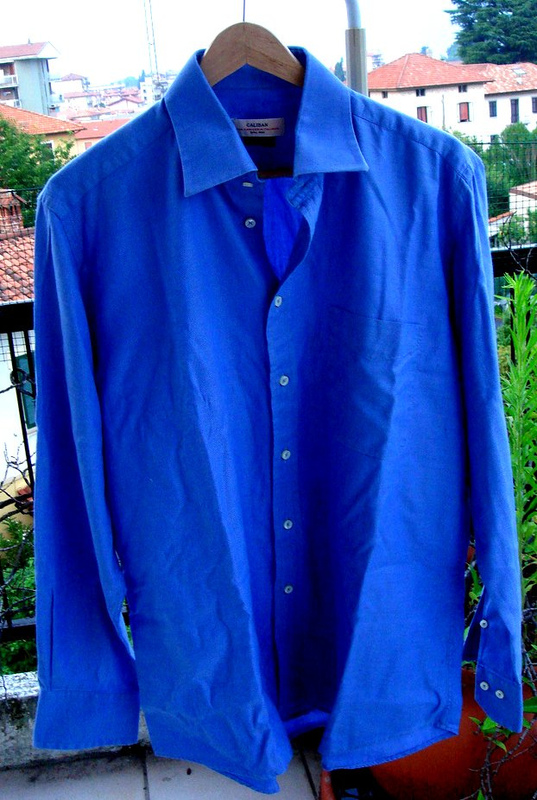 Since I started following sewing blogs earlier this year, I got fascinated by refashioning men shirts… My goal is to try a new technique every time. 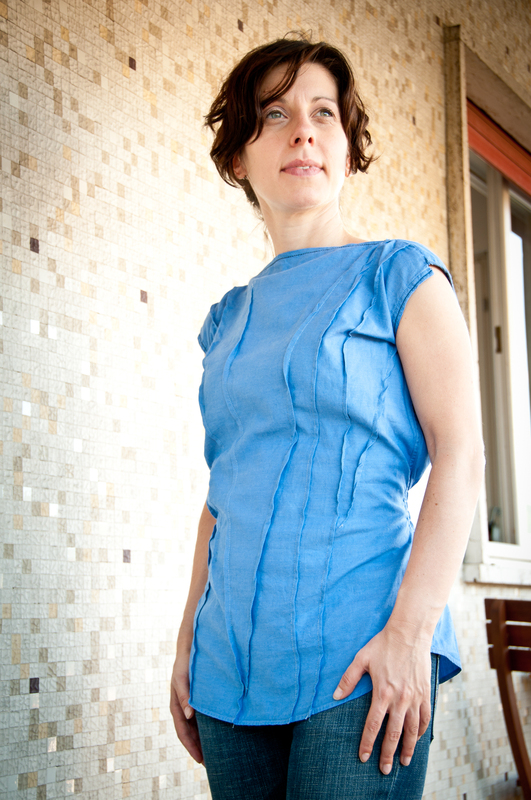 So here is a new attempt which is also part of my two summer projects… Summer Essentials Sew-Along and Wardrobe Refashion. 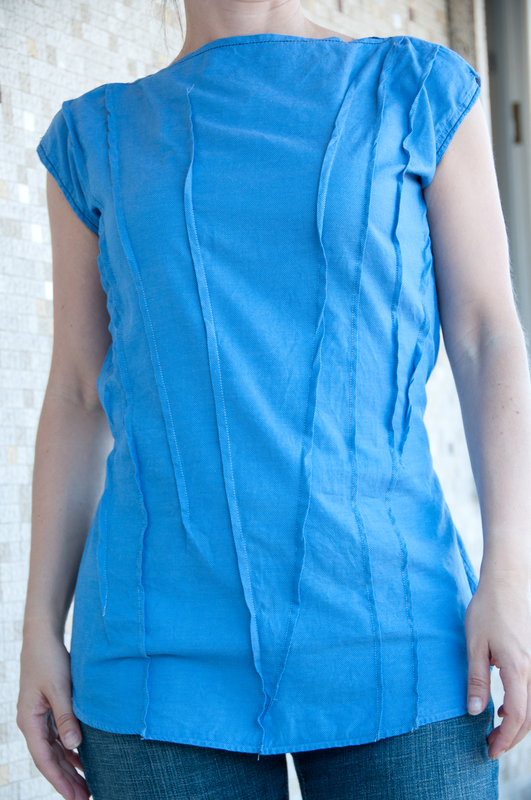 It all started with wanting to try shirring and creating a top out of this shirt. 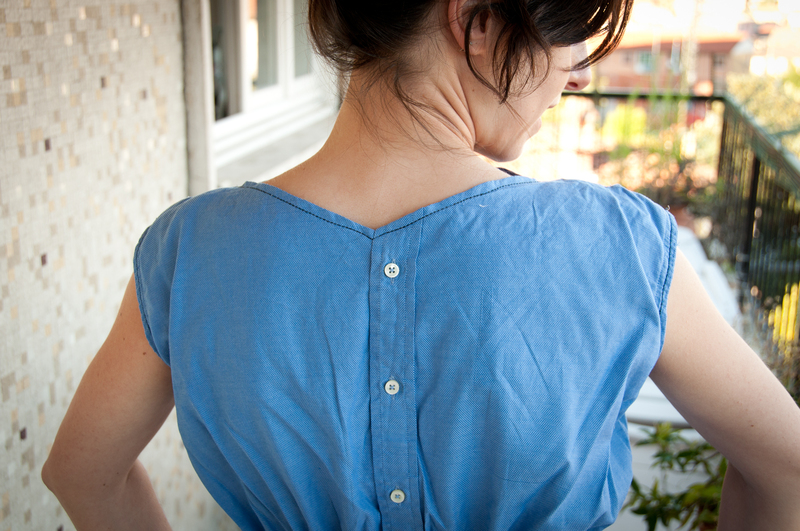 It seemed so easy to do from this shirring tutorial that I finally gave it a try. I must say that’s it works like magic… the sense of accomplishment is great. I shirred 5 rows using my machine foot as guide for the distance. Then I got this idea of creating asymmetrical pin tucks…. so I simply pinned the fabric creating some lines by standing in front of the mirror (I don’t own a dress form). 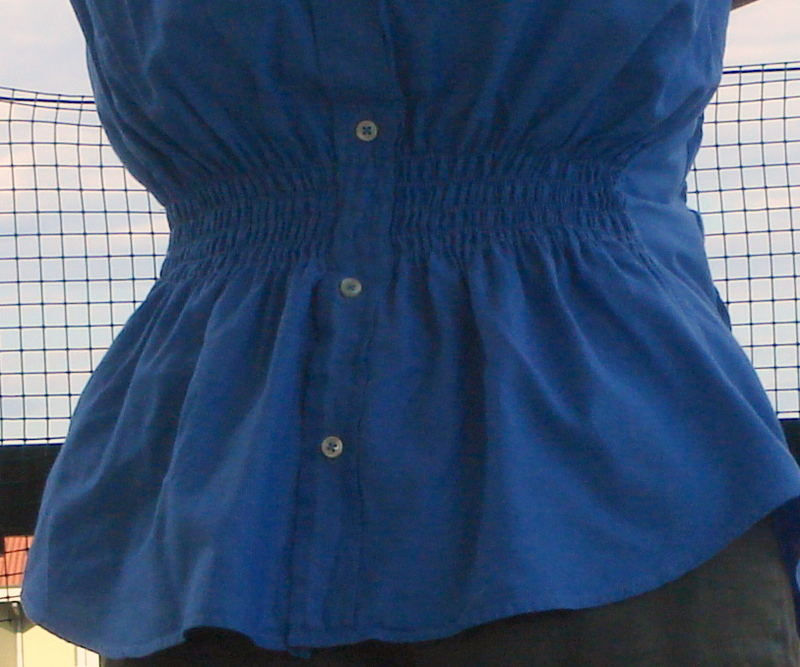 Since I wanted the shirt to have some 3D feeling to it… I simply didn’t iron down the resulting pin tucks. By the way, they are sewn with a straight stitch, 1/4″. Given that I was not following any specific pattern when creating the front design, I freely adjusted it to my body shape. Regarding the neck opening… I originally wanted to create a boat neck (which you still see at the front), but then I started playing with a V-shape at the back. I used dark blue thread for the neck and shoulders to create some contrast. I left the bottom and side hems as they were in the original shirt…so no additional work there. I also reused part of the stitching from the arm area by cutting just one inch above the underarm stitching… Have a look at this fantastic tutorial by Kirsten which is also where I got the inspiration for turning the shirt around. 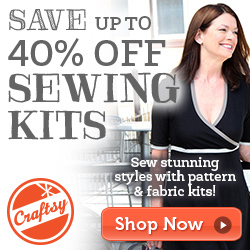 Have you refashioned shirts lately? I would love to see your projects. Wow, the back v-neck is very pretty! Thanks for the shirring tutorial, you’ve saved me some looking around, since I’m going to need it for my next summer essential! Looks great ~ love the ideas and links. I got the inspiration to refashioned a skirt I have been holding onto for a while. This is so lovely! I have a shirt I keep dragging out and trying on that would be great for something like this. Really nice shirt !! is this brand available in italy also ?